Activity takes about three to four 50-minute class periods. Additional materials are needed for the hands-on activities. 3.5 Ecosystems are affected by availability of energy. Ecosystems are affected by changes in the availability of energy and matter. 3.5 Ecosystems are affected by availability of energy..
MS-LS2-4:	Construct an argument supported by empirical evidence that changes to physical or biological components of an ecosystem affect populations. MS-LS2.A1:Organisms, and populations of organisms, are dependent on their environmental interactions both with other living things and with nonliving factors. MS-LS2.A3:Growth of organisms and population increases are limited by access to resources. MS-C3.2: The observed function of natural and designed systems may change with scale. MS-C7.4:Systems in dynamic equilibrium are stable due to a balance of feedback mechanisms. MS-P4.4:Analyze and interpret data to provide evidence for phenomena. MS-P6.3:Construct a scientific explanation based on valid and reliable evidence obtained from sources (including the students’ own experiments) and the assumption that theories and laws that describe the natural world operate today as they did in the past and will continue to do so in the future. 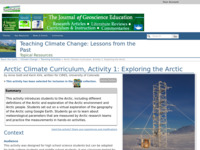 MS-P8.1:Critically read scientific texts adapted for classroom use to determine the central ideas and/or obtain scientific and/or technical information to describe patterns in and/or evidence about the natural and designed world(s). HS-LS2-6:	Evaluate the claims, evidence, and reasoning that the complex interactions in ecosystems maintain relatively consistent numbers and types of organisms in stable conditions, but changing conditions may result in a new ecosystem. HS-C3.2: Some systems can only be studied indirectly as they are too small, too large, too fast, or too slow to observe directly. HS-P8.1:Critically read scientific literature adapted for classroom use to determine the central ideas or conclusions and/or to obtain scientific and/or technical information to summarize complex evidence, concepts, processes, or information presented in a text by paraphrasing them in simpler but still accurate terms.